Very few persons become a legend in their lifetime. The Kirana Gharana doyen Pandit Bhimsen Joshi is certainly one among them. But in becoming so he had to undergo utmost sufferings. Starvation and humiliation. Born at Gadag in the Dharwar district of Karnataka on 14th February 1922 he developed an early interest in music by listeningto his mother's chanting of devotional hymns. He first received lessons in music from local teachers Chinappa Kurakoti and Shyamacharya. But itwas a chance listening of a gramophone record of the Kirana doyen Ustad Abdul Karim Khan, released by the now defunct Odeon Gramophone Company, in which the Ustad had rendered a khayal in Raga Basant that attracted him a lot Thereafter he decided to become a singer of that very tradition. His grandfather was a well-known 'kirtankaar' and his father Pandit Gururaj, an eminent Sanskritscholar and an educationist however did not approve of his son becoming asinger. In order to find a Guru who would fulfill his long cherished desire he left his house while still in his teens. Bhimsen had to face extreme hardship for several years. He went all over India in search of a Guru. He visited Calcutta, Lucknow, Indore, and Gwalior where he was well received by Ustad Hafiz Ali Khan, Krishnarao Shankar Pandit and Rjabhaiyya Poochhwale. In Gwalior he attended the music classes at, the Madhav Sangeet Vidyalaya mainly to have a free evening meal the Vidyalaya provided to its students, by the Scindia ruler. Leaming music was no easy vocation in India during those days for persons who lacked patronage and money. One recalls most of the music students in Gwalior performing domestic chores at their Gurus' houses without being given a single paisa and a morsel of food. Bhimsen also endured all such hardships in the earlier days of his life. It was during his meeting with Pandit Vinayakrao Patwardhan at Jalandhar during the Harvallabh music festival that he learnt that the teacher he had been looking for all across the country in fact lived quite close to his home at Kundgol in Dharwar district. He was none other than Pandit Rambhau Kundgol popularly known as Sawai Gandharva and a senior disciple of Ustad Abdul Karim Khan. Sawai Gandharva at first declined to accept Bhimsen as his disciple but later agreed to teach him on the recommendation of one of his senior pupils, Gangu Bai Hangal. The legendary Sawai Gandharva taught him for almost seven years. Bhimsen worked very hard and finally he received Guru's blessings and approval to give public recitals and gain further experience. 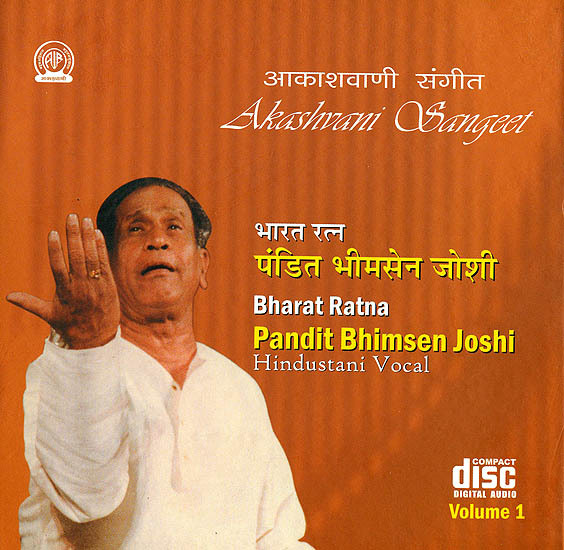 Pandit Bhimsen Joshi's singing is noted for his great lung power and a stentorian voice. He is equally at ease in rendering Khayals, with a clear delineation of the Ragas, as well as the lighter forms like Thumri. Bhajan, Marathi'devotional songs and Marathi natya-sangeet. In his earlier days he had also acted in several Kannada plays. For almost half a century he has dominated the classical music scenario all c the country and has received wide appreciation almost all over the globe. received his first platinum disc in 1986. Padmashri in 1972. Padma Bhushai 1985 and Padma Vibhushan in 1999 and the Sangeet Natak Akademi Award in1976. He has recorded a large number of gramophone records. LPs and I which are in great demand. The legendary sarod maestro Ustad AI i Akbar Khan has paid rich tribute: Pandit Bhimsen Joshi by stating ""I have a great respect for Pandit Bhimsen jo We are very old friends and were born in the same year. I believe that he is last man of this century. as a musician. to sing his art and I don't see replacement for may be hundreds of years". According to Dr. Prabha Atre .. Voice. Even at his advanced age engulfs the listener like a flood of bright II pervading the whole environment. It is a voice with a tremendous mass app While the Kirana artists have voices that are thin and high-pitched. his is q: the opposite-broad. Dense. Wide ranging and capable of prolonged spans". It would be incorrect to regard him mainly as a Kirana doyen. He has assimila the redeeming features of several other styles including that of Gwalior. Patand of Agra-Atrauli. Thereby creating an entirely individualistic style of his c which could well be regarded as the "Bhirnseni Gayaki". The Raga Todi is a melody known for its serenity and the instant impact that it makes over its listeners. The Ragamala paintings depict this Raga's hold over the animals and 'particularly over deer. It is the Aashraya Raga of the Thaat Todi having Komal Dhaivat as its Vaadi Swara and Komal Gandhar as its Samvaadi Swara. The raga is sung in the late hours of morning. It is a Sampoorna Raga though the note Pancham is often omitted in the ascent. Aroha: Sa Re Ga Ma' Pa Dha Ni Sa. Of the several varieties ofTodi the one which many musicians like to render is the Mian-ki-Todi which is supposed to have been improvised by the legendary Mian Tansen. Pandit Bhimsen Joshi's rendering of Sadarang's khayal "Daiyya Bat Dubhar Bhayee" in Raga Todi set to Vilambit Ektaal is one of his most memorable rendering that he has given before an invited audience in Delhi in December 1965. His gayaki attains perfection while he proceeds with continuous improvisations demanding a total involvement of his musical instincts. He is known for his extraordinary capability in establishing an instant rapport with his listeners and this is what he has exactly done with the leisurely rendition of this charmingly created piece of music. The brief Alaap at the commencement came in handy to establish he raga's basic mood. The subsequent handling of the sthayee and the antara was replete with showers of musical ecstasy. Be it the alaap-badhat or the fast taan flourishes with varying permutations. with bold and powerful gamakas.the listener is transported to a realm of intense musical delight. The drut teen tal composition Langar kaankariya ji naa maaro delights with its liltingly improvised variations in rhythmic sequences. What impresses most is his vocal prowess that attains further charm and gets more mellifluous as the recital progresses. He had excellent accompaniment on the Sarangi by Ustad Sabri Khan and on the Tabla by Ustad Faiyaz Khan. A section of timeless items from the Akashvani Archives of melodious rendering by legends of the Indian music tradition.